Well, that’s a question I had think about for some time. Looking back at the last 1000 or so weddings, I can’t think of anything that I would classify as strange. But I’ve seen a lot of things that I would identify as unexpected. For example, I recently officiated a ceremony at an area hotel where the staff had set up a traditional unity candle. When the time came for the bride and groom to join their individual flames by lighting the pillar candle, the couple discovered that the pillar candle was defective. It failed to light. After much frustration and even more determination, they decided to create Plan B. 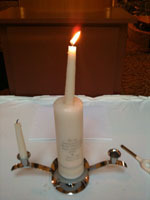 Using the molten wax as a base, they extended their pillar candle with one of their tapers. Having a single flame to represent their lives now united, was the only option for this couple. What about you? What is the strangest thing you have seen at a wedding? One Response to Strange Things Happen! Speaking of getting the flame started: I was at a wedding in this restored historical church in Joliet. There was a good sized wedding party (7-8 on each side) and lots of guests. When the minister was saying a prayer, I looked up (ok I peeked) and saw the tulle that was wrapped around one of the candelabras was on fire! One of the groomsmen grabbed the candelabra and carried it out of the church. It looked like a huge Olympic torch going down the aisle.